Written by Bryan Boomershine on January 18, 2017 . Posted in Blog. January 18, 2017 Palm Desert, CA: Chicago North Shore interior designers Robert Levine and Bryan Boomershine have opened their second boutique design store Robert Bryan Home at 73260 El Paseo in Palm Desert. 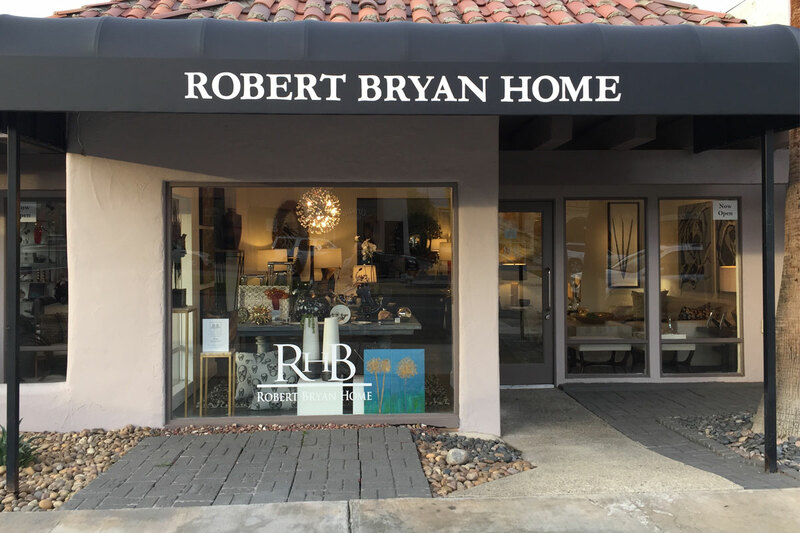 Robert Bryan Home offers interior design services, custom furnishings, table top accessories, lighting and abstract art by Bryan Boomershine. The design duo has been in the home furnishing and the design industry for over 30 years; from wholesale design and manufacturing to residential and commercial design services. Robert Bryan Home is very sculptural and free flowing, embodying passion and timeless design through organic lines and textures. Warm neutrals and earth tone colors mix with silver and gold accents creating an elegant vibe. “We love to mix styles and periods. Interiors are much more interesting and inviting when you mix” says Levine. Good design is defined when beauty meets function. Robert Bryan Home have been responsible for many residential projects throughout the U.S. and Central America.